Clinically tested. Calms and moisturises. pH skin balanced. For sensitive skin. Certified natural skin care. Free or synthetic preservatives, fragrances, colourants and raw materials derived from mineral oils.Almond Body Care Range This particularly mild range is perfect for sensitive and irritable skin. Created using few, carefully selected key ingredients, it calms and gently cares for the skin helping to restore the skin's natural balance. Almond The organic almond has a shell to protect its kernel just as the natural Almond Skin Care protects sensitive skin. 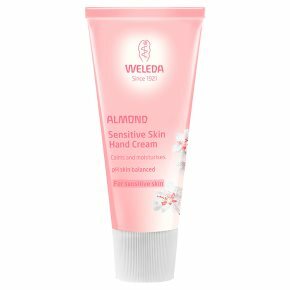 Sensitive Skin Hand Cream The fast absorbing cream, with organic almond oil, calms skin prone to irritation, moisturising and reducing skin tightness. It helps to strengthen the skin's own protective layer leaving hands feeling smooth and silky soft. Clinically tested and approved for skin tolerance.